Freshman center Ricky Doyle quickly became one of the biggest surprises of the early part of Michigan’s season, scoring in double-digits five times before January. But the freshman center tallied 10 points or more in just three games from January 1st until the end of the year, as health issues and improved competition limited his efficiency. Freshman center Ricky Doyle quickly became one of the biggest surprises of the early part of Michigan’s season, scoring in double-digits five times before January. His 10 points against Oregon set the bar high early on and it took him ten games to earn the starting spot at the center position, a role that he held for the next 19 games. But the freshman center tallied 10 points or more in just three games from January 1st until the end of the year, as health issues and improved competition limited his efficiency. Still, Doyle exhibited significant growth this year, as the Cape Coral, Florida native matured physically from the out-of-shape 18-year-old we saw in August. In the Wolverines’ Big Ten tournament matchup with Frank Kaminsky and Wisconsin, Doyle scored 12 points in 18 minutes, days after he was in the hospital and, in his words, nearly immobilized with a stomach virus. Doyle set a high ceiling for himself against Oregon, and consistency and conditioning will be key for him as he projects as next year’s starter. Pick-and-roll offense: Despite his size, Doyle exhibited soft hands from day one, which made him reliable on the pick-and-roll by the end of the year. Though it accounted for just over 16.4% of his usage, the freshman scored 1.286 points per possession as the roll man, according to Synergy Sports. And when the Wolverines could get Doyle going, it was usually a good indicator for success — he tallied 7.7 points per game in wins and just 4.6 in losses. Around the rim: As evidenced by his spurts against Kaminsky in the Big Ten tournament, Doyle was an efficient scorer around the basket. Per Synergy Sports, his eFG% around the rim was 67.9%. Michigan struggled at times to get him the ball, but when it did, Doyle finished. Getting to the free-throw line: Doyle shot just 60.9% from the free-throw line, but he didn’t have issues getting there. His free-throw rate was 57%, and he wasn’t afraid to fight through contact. The freshman was always expected to be the Wolverines’ bruiser inside, and he proved that with his play this winter. With a little added strength, there’s a chance that many of those two-shot fouls will result in and-one opportunities as a sophomore. Defensive Rebounding: Despite being Michigan’s biggest player, Doyle’s rebounding statistics left a lot to be desired. He rebounded just 11.9% of opponents’ missed shots when he was on the floor. Only three Wolverines in the rotation posted worse defensive rebounding rates: Spike Albrecht, Muhammad-Ali Abdur-Rahkman, and Aubrey Dawkins. Michigan’s scheme prioritizes boxing out over grabbing rebounds for big men, but Doyle’s defensive rebounding rate was so low that it is a major red-flag going forward. Posting up: Doyle had difficulties scoring with his back to the basket as the level of competition increased. Michigan scored just .75 points per possession when Doyle shot or passed the ball out of the post. He only posted up 36 times this season, but his grade measures out in the 34th percentile nationally. Beilein raved about Doyle’s hook shot in the preseason, and it has the potential to be a weapon, but he needs to move quicker and be more assertive when he catches the ball down low. Fitness: Though he trained with strength and conditioning coach Jon Sanderson last summer, Doyle still seemed a step or two behind come November. Though fitness became less of an issue as the year continued, the freshman played 30-plus minutes only twice. Doyle will spend another summer with Sanderson in Ann Arbor, and his fitness and health could be critical next winter. Defensive rotations: Doyle had the tendency to get caught out of position defensively. At times he would chase blocks that he couldn’t reach, leading to second chances. Other times he’d be a few steps late on his rotations, leading to an extra foul or any easy layup. These concerns are probably equal parts physical and mental, but both should improve next season. 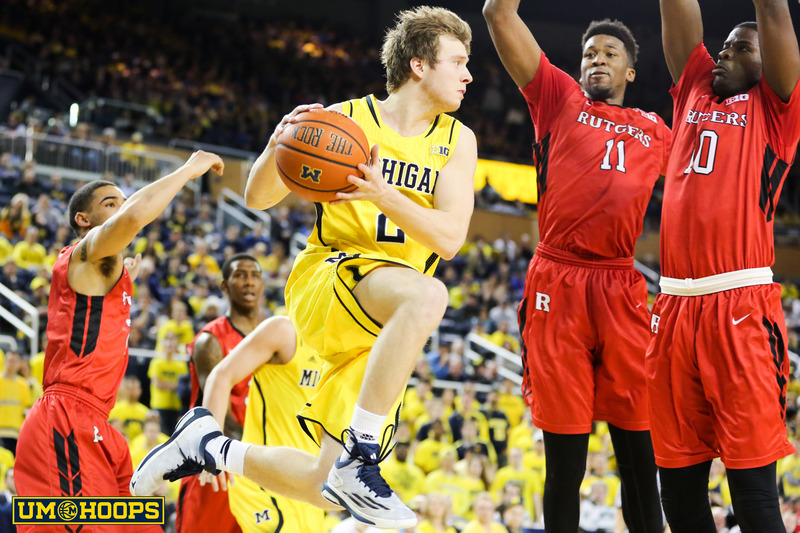 Beilein: “You can get a lot of big guys who are not going to take charges. They don’t embrace physicality, they shoot fadeaway jump shots because they don’t like that physicality — that’s never been in Ricky’s nature since the day he walked in here. Doyle certainly had his moments, but illnesses hampered his ability to maintain any sort of consistency. As Beilein repeated frequently, he was routinely matched up against players two or three years his senior — there were few easy assignments for the freshman. It’s tough to play 30 games as a freshman post player in the Big Ten, but Doyle showed promise. His freshman campaign was far from flawless, but there’s plenty to be excited about with Doyle going forward. Doyle can make a serious leap by just continuing to get in better shape and improving his rebounding, but he also has some untapped ability to be a bigger part of the offense. When reporters asked John Beilein what improvements Doyle needs to make in the offseason, the coach’s response came without much thought: The center needs to develop his jump shot. 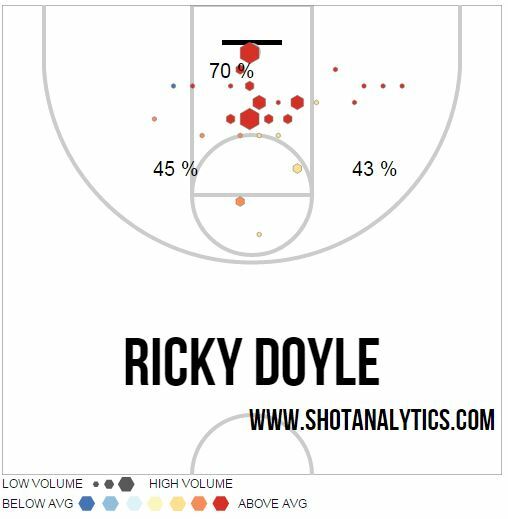 Synergy Sports indicates Doyle attempted jumpers on just five possessions all season. The center has looked comfortable during those limited opportunities, and it’s reasonable to expect a step forward by next year. Doyle’s role next year will depend on what Michigan’s roster looks like next year. There’s still a chance that Max Bielfeldt could return and the Wolverines are recruiting big men like Moritz Wagner (offer) and Mike Edwards. DJ Wilson and Mark Donnal should also play a role at the five spot, but Doyle looks to have a strong grasp on the starting center role going forward.